Pictured arrested Florida man, and the note the man's girlfriend, Carolyn Reichle managed to slip to a vet who in turn notified authorities. Pictured arrested Florida man, Jeremy Floyd and the note the man’s girlfriend, Carolyn Reichle managed to slip to a vet who in turn notified authorities. A Florida woman, Carolyn Reichle outfoxes her abusive boyfriend, Jeremy Floyd after managing to slip a note to a vet to call police after taking her hostage and threatening her life two days earlier. 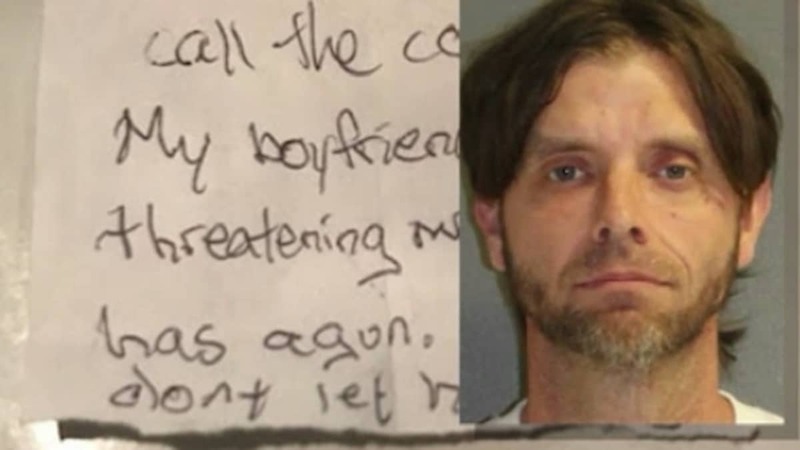 A Florida woman has been rescued after passing on a note to a veterinarian pleading help on account of her ‘armed’ boyfriend who was beating and threatening her. Freed from her tormenter was Carolyn Reichle, 28, with the woman’s 39 year old boyfriend, Jeremy Floyd taken into custody on Friday according to a statement via the Volusia County Sheriff’s Office. The woman’s rescue came two days after Floyd first took the woman captive at their DeLand, Volusia County home. Foxnews reported the alleged incident beginning Wednesday with the girlfriend accusing Floyd of repeatedly beating her and threatening her at gunpoint. So incensed had matters become, that at one point, the couple struggled over a handgun that fired off inside the house. Reichle spent the Thursday recovering from a head injury. The next day while thinking of an escape plan, she convinced Floyd, a convicted felon, to allow her to bring her dog to the DeLand Animal Hospital, police said. Floyd insisted on going with her. ‘On the drive to the vet, Floyd reportedly again pointed the gun at Reichle, threatening to kill her and her family,’ police said. The vet called police, who responded and took Floyd into custody. Cops also recovered a handgun. Reichle was taken to the hospital and treated for her injuries that included a head wound, a black eye and bruises, according to the sheriff’s office. A search of the couple’s home led to authorities discovering two bullet holes. Upon being booked, Floyd was charged with domestic violence — aggravated assault with a firearm, false imprisonment, possession of a firearm by a convicted felon, possession of ammunition by a convicted felon and simple battery. The boyfriend is being held without bail. Not necessarily clear is what led to the boyfriend initially abusing his girlfriend and then holding her captive. Also not clear is whether there had been prior incidents and whether police had previously called upon Reichle and Floyd. Others on the web meanwhile wondered how the convicted felon managed to acquire a gun….